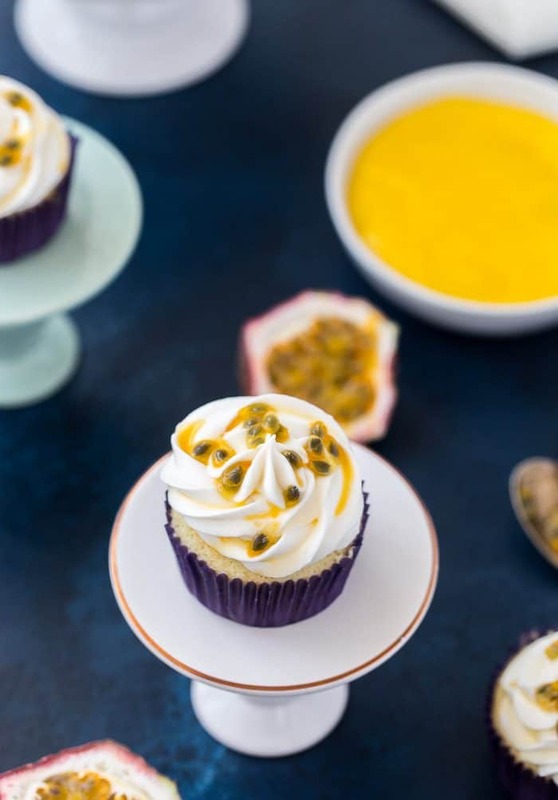 These tropical passion fruit cupcakes start with an airy coconut cupcake infused with passion fruit puree. 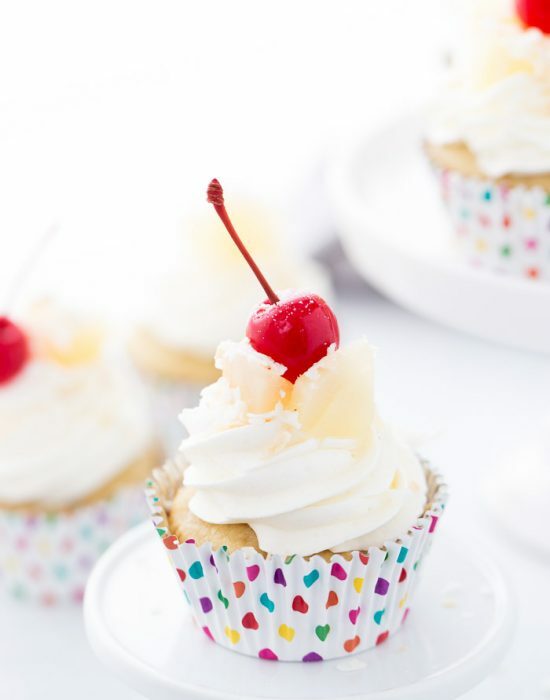 Topped with coconut whipped cream, these tropical cupcakes are perfection. Happy Monday friends! I have tropical cupcakes for you today because nothing says Mondays to me like cupcakes. 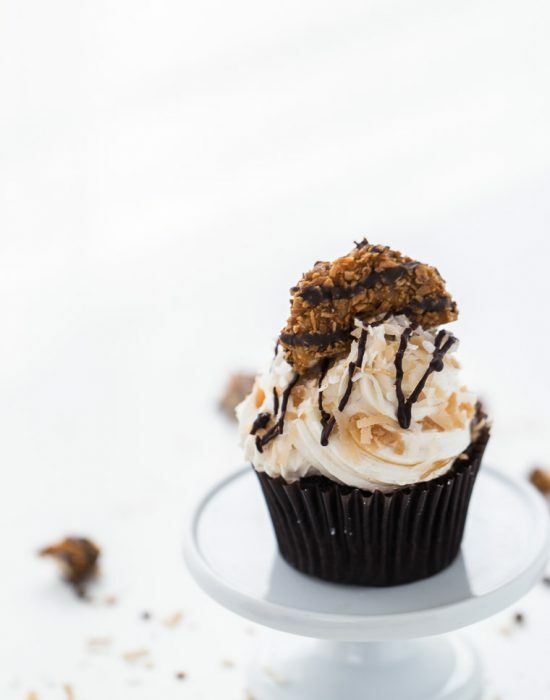 If you follow our #cupcakemondays you will see that a lot of people agree the best way to face a Monday is with one of these little cakes in hand. 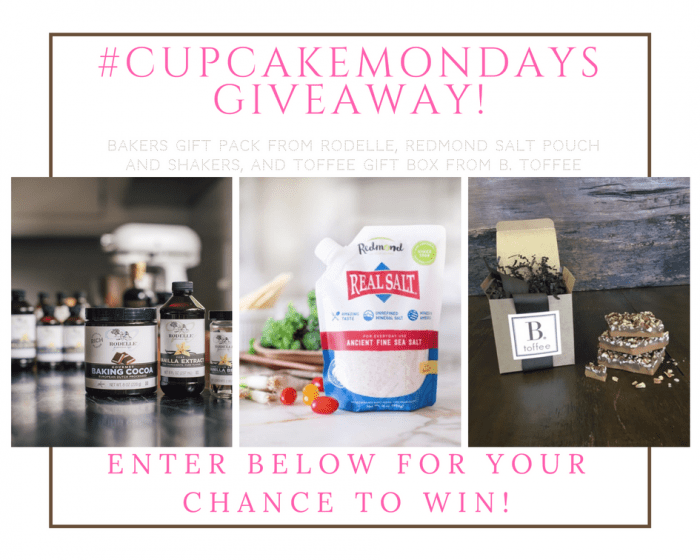 To celebrate our love for cupcakes, a few of my fellow cupcake enthusiasts and I are sharing with you our favorite summer cupcake recipes today in a big #CupcakeMondays party. 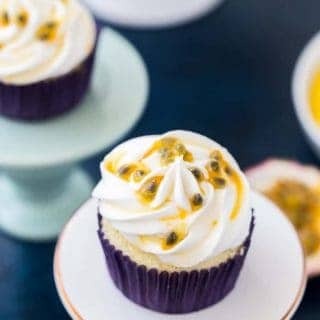 These tropical passion fruit cupcakes are my contribution to the party and are now truly my favorite cupcakes to date. 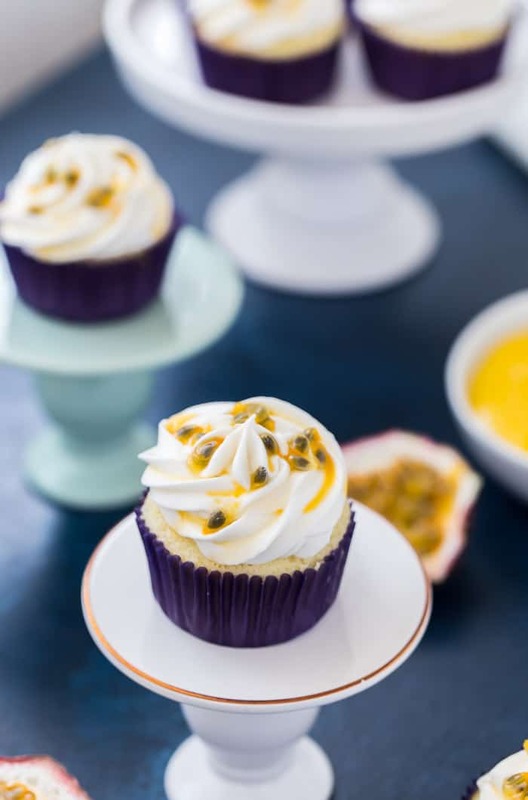 Light, sweet and filled with tropical flavors, these coconut passion fruit cupcakes will blow your mind away. You already know I LOVE passion fruit (we talked about it over here when I shared the recipe for this bunkers awesome passion fruit bundt cake). So it was only a matter of time for me to combine it with coconut, my second love. 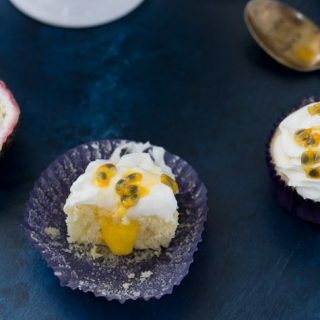 Coconut + passion fruit = tropical bliss in my opinion and that’s exactly what these tropical passion fruit cupcakes are. 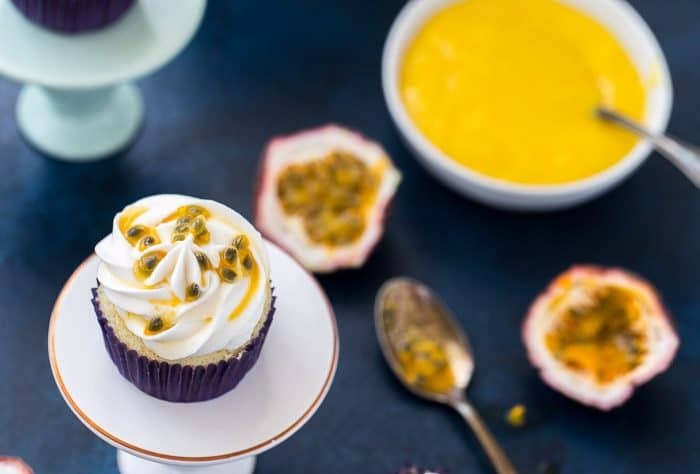 Starting with a fluffy coconut cupcake that is infused with passion fruit puree, you can taste the airy breeze of the tropics right in the cupcake. To keep with the light nature of the flavors, I topped the cupcakes with a sweet coconut whipped cream. Using coconut cream and a dash of heavy cream, the frosting is to DIE for. Just try not to eat it all by the spoonful before frosting the cupcakes. 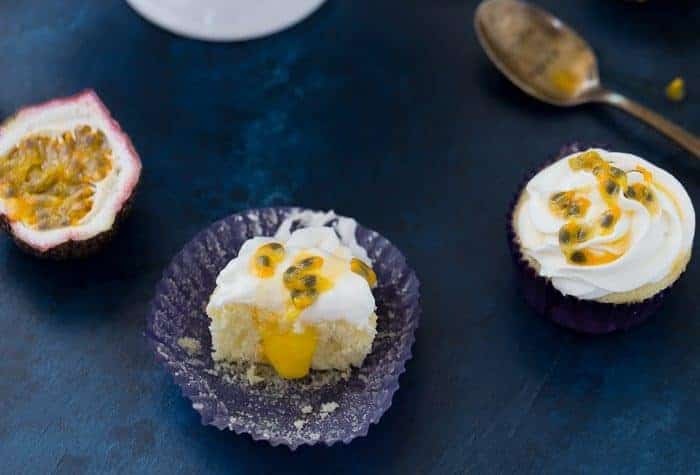 These tropical passion fruit cupcakes are epic and really perfect in the summer. You need to make them and I know you will love them as much as I do. Preheat oven to 350 degree F. Line cupcake tins with liners. Whisk together half of the milk, coconut cream, egg whites, egg, passion fruit puree and vanilla extract. Sift the cake flour in the bowl of an electric mixer fitted with the paddle attachment (Or a medium bowl if using a hand mixer). Combine the rest of the dry ingredients including sugar. Stir together on low speed for 30 seconds. 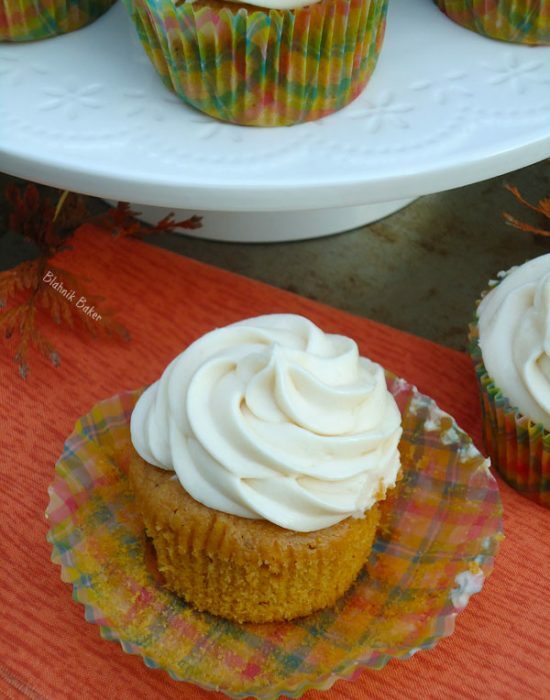 Divide batter into prepared cupcake liners and bake for 12-15 minutes or until a cake tester comes out clean when inserted in center of cupcake. Chill your stand mixer bowl and whisk for at least 15 minutes. If using a hand mixer, chill a medium bowl and the whisk attachment. Combine the coconut cream, heavy cream and vanilla extract. Whisk on medium high speed until soft peaks form, about 3-4 minutes. Whisk for an additional minute to stiff peaks. A sweet and slightly tart passion fruit curd. Perfect as a filling, topping or to enjoy by the spoonful. Prepare a double boiler by bring a medium sauce pan of water to bowl. Place the cubed butter into a medium heat proof bowl and set aside. In another medium or large heat proof bowl, whisk together the passion fruit puree, sugar and egg yolks. Place the large bowl over the boiling water and whisk continuously until the mixture thickens, about 15 minutes. You should be able to draw a line with the back of a spoon and it holds. Once ready, pour the passion fruit curd mixture over the butter. Stir in the vanilla extract and mix until the butter melts and incorporates. Place a plastic wrap directly over the surface of the curd. Refrigerate until thickened, about 2 hours or overnight. These look INSANE! I love anything with tropical flavors :). It’s like taking a vacation without having to get on a plane! Happy #CupcakeMondays! Exactly!! Going to someplace tropical in the taste buds lol! Passionfruit is absolutely my favorite to use for baked goods. this looks scrumptious and beyond! Thank you for bringing us together on #cupcakemondays!!! These are my favorite!! Passionfruit is the best ever! Specially on baked goods! You should try passionfruit mousse if you ever get a chance. It’s a very popular dessert in Brazil, and probably my favorite dessert if I ever had to really pick just one! 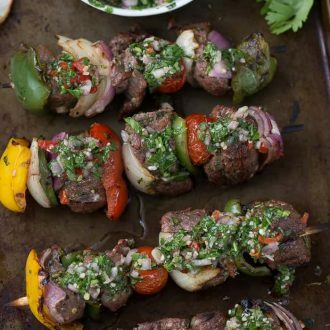 Love how bright and flavorful these are!! Oh my yes, I will try it. Sounds incredible!! These cupcakes transport me to somewhere tropical 🙂 It’s a beautiful contribution to Cupcake Mondays! Cupcakes are making a COMEBACK! They’re actually my favorite way to eat cake…they have such a perfect frosting:cake ratio. These are my tropical fruit loving cupcake DREAM. I just wish I had a more reliable source for passionfruit! 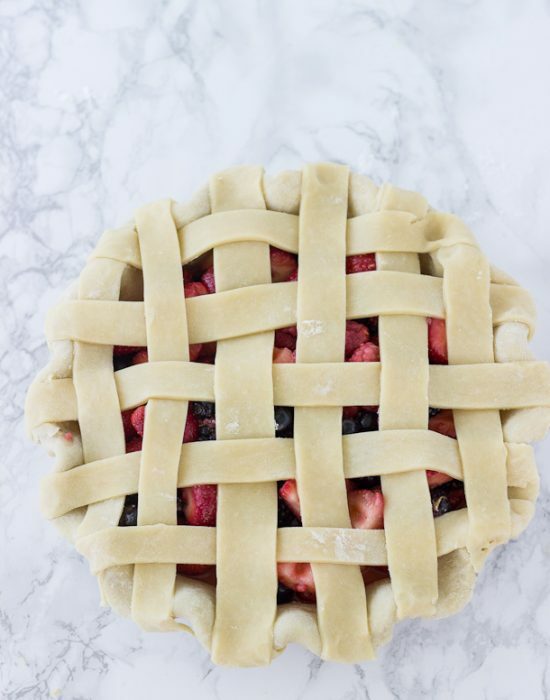 The ratio is ideal and you don’t feel like you need a big slice. So satisfying!! I know – my local Wegmans carry the fruit in the summer but they always have the puree/pulp in the frozen section. Cupcake Mondays are so fun and these cupcakes take the cake! 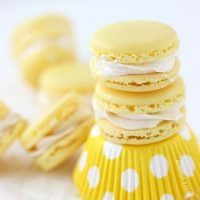 I love tropical flavors as you know and that passionfruit filling looks incredible! I love the idea of including the passion fruit curd! I love passion fruit and it just sounds absolutely wonderful in a light bright tropical cupcake. Just a sign we all need more cupcakes in our lives! We all need more cupcakes … always! I never would’ve thought to use passion fruit!!! These look amazing! And the filling- yes please!! It’s a fun flavor in tropical treats! ahhh i love passion fruit too! whenever i go out and see passion fruit flavored things in restaurants or bakeries or wherever, i always end up getting it lol. Same here – I always always end up getting it! The published passion fruit recipe list “untitled ingredient “ what is the ingredient and amount? Althea – sorry for the typo. There is no missing ingredient. Just a malfunction in my recipe card plugin. 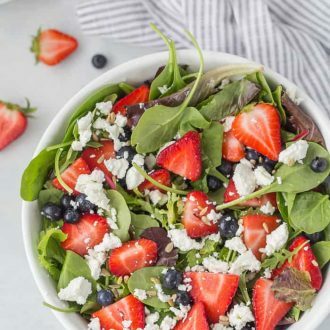 This recipe looks delicious can’t wait to try it. My best summer dish is having a good bowl of fruit cupcakes!